This movie was just hyped way too long and too often. Problem is the movie was the trailer and there was not much else other than what you saw in the trailer. TMG is being generous with the 5.0 TMG rating. Robert Downey Jr. always gets some bonus points. While very good in The Hangover, I am beginning to find Zach Galifianakis quite boorish, one dimensional and downright gross at times. No spoiler her to tell you that a fat, adult male masturbating at night in a car with Robert Downey Jr. is not funny. It is just gross. Two guys meet by accident, literally, and then both get tossed off a plane by the TSA. They choose to drive together in a rental car from Atlanta to Los Angeles. From there, this movie just does a rip off of Planes, Trains & Automobiles (1987). 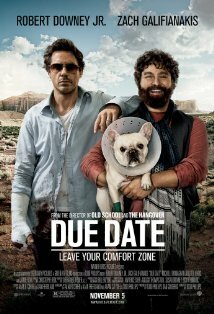 Downey’s character is trying to get home for the birth of his child and Galifianakis is pursuing his fantasy to star with Charlie Sheen on TV in Two and Half Men. There are a few laughs along the way but you already laughed at them ten times before while waiting these last few months to see Salt, Inception, Secretariat, Red, and…. may God and your date have mercy on you, Paranormal Activity 2. If there was any silver lining, I did find this movie more frightening and thought provoking than Paranormal Activity 2—clearly the worst excuse for a “movie” in this past century. It was frightening because Robert Downy Jr. was carrying a sock monkey all the way across the country and TMG has always found those things a bit freaky. Who buys a sock monkey for an newborn anyway? The only real star of this film was Sonny, Galifianakis’ pet dog. They should have given the dog more lines. Why was Jamie Foxx in this film? No reason. I assume he just needed the work and more Miley Cyrus jokes proved to be unproftable. I must admit the screen writer and director hold the US Gestapo, aka the TSA at airports, in the same esteem I do. The crude, ill mannered, bumbling and ill tempered TSA agents portrayed in this movie stack up well compared to the totally incompetent and worthless TSA agents TMG encounters on a weekly basis. When is Michael Moore ever going to do a documentary entitled “The Biggest Waste of Money in US History—The TSA.” Due Date had value if only in making the point first. Hollywood irony is that you cannot feature smoking in films because it is bad for you. No argument from TMG here. But this movie celebrates riding in the back of an open bed pick up, using a computer (a Mac of course) on a bed comforter (big fire hazard), slugging energy drinks, careless gun use, and smoking pot while you drive. And perhaps the most irresponsible of all, eating at a Waffle House. TMG cares less for any of this political correctness as long as it is funny or realistic. Galifianakis would be fired from radio or TV and villified by the Hollywood elite for making the racist “zebra” joke in this film. TMG was not offended. It just was sixty year old grammar school stupidity and not funny. All in in all, a well edited and funny trailer. The full film has a quick expiration date and due on the DVD rental shelf very soon.